A long night is in store for The Wave, Muscat after their boat was ‘T-boned’ on the start line of today’s tenth and final race at the Extreme Sailing Series in Nice. It was an up and down day for Leigh McMillan’s team, as they attempted to avoid disasters hoping to preserve their overall lead in the 2012 Extreme Sailing Series championship. But this proved tricky with a reaching start line positioned within metres of the beach, the boats zooming in on starboard and tacking with little room left to manoeuvre and with the wind both gusty and shifty, peaking at around 25 knots towards the end of the afternoon. Coming into the start of today’s last race, there was a four boat pile up as the teams attempted to jockey for position on the line. Amid this, Alinghi attempted to duck The Wave, Muscat’s transom but instead ended up driving their bow into the stern of the Omani boat’s port hull, creating a hole from the deck to below the waterline in the delicate area between the aft beam and the rudder. The crash, which could be heard by the gathering spectators on shore at the Promenade des Anglais, also left the Austrians out of racing. After pulling back into Nice’s Vieux Port, The Wave, Muscat was craned ashore. Meanwhile the Oman Sail shore team led by boatbuilder Joe Lees is preparing to be up all night in order to repair the giant gash in the carbon/Nomex hull. After a jury hearing The Wave, Muscat was awarded average points for race 10, leaving them third overall, while Alinghi was penalised six points. Fortunately tomorrow morning’s racing has been cancelled so if the repair work goes to schedule, The Wave, Muscat should not miss any racing. Austrian double Olympic gold medallist Roman Hagara’s team will also be craning out their Extreme 40 Red Bull Sailing Team tonight – and Hagara says missing a day of racing is out of the question. “It was quite a good day for us until that last race. It just came down to one bad race. The boat has a big hole in it and it will be a long night for us as we try to repair the damage. We have to get it fixed by tomorrow, we need to race and we will do everything possible to repair the boat.” Both Red Bull Sailing Team was also awarded average points for the final race they missed, good for the Austrian team leaving them in first place. Two thirds of the way into the afternoon, the results were looking grim for Oman Air holding sixth place overall in the eight boat fleet. However American skipper Morgan Larson and his team put in a strong finish, winning today’s final two races to elevate them to fourth place overall. While they managed to pull it back from the brink, on another occasion they managed to make a swift recovery when their ‘5th man’, New Zealand Olympic Laser sailor Andy Moloney, went swimming. “Andy missed the toe strap coming out of the leeward mark and went over the side,” said Larson. “But it was good – he swam back and got back onboard quickly and we only lost a couple boats.” Otherwise the American skipper praised the crew work of his team mates including Will Howden, Charlie Ogletree and Nasser Al Mashari. 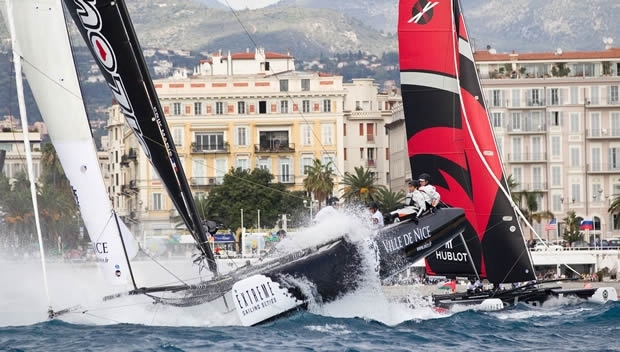 Racing is set to resume at the Extreme Sailing Series Nice at 1300 CET. Conditions tomorrow are still forecast to be brisk, but a little less than today.